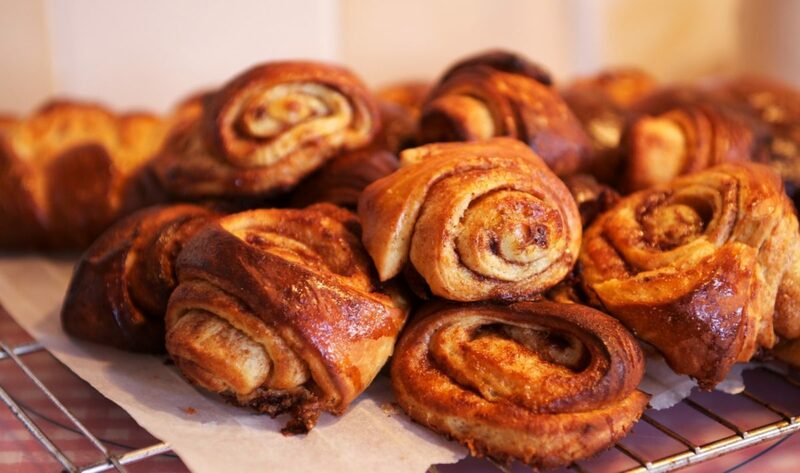 Korvapuusti is made with a traditional ‘pulla’ dough. Pulla is a Finnish sweet bread style dessert flavoured with cardamom. Similar to English Hot Cross Bun. You can use this recipe for making many different kinds of pulla. I’ve struggled finding coarse cardamom in the UK where normally it’s sold in the pod. It’s very laborious to peal and grind them as you’ll need something like a tablespoon of it. If you live in London, you can always visit The Finnish Church in Rotherhithe and buy some from their Finnish food store. Mix in the egg, sugar, salt, cardamom, some of the flour and butter. Keep mixing while adding rest of the flour. Mix till smooth and stretchy. Using a rolling pin, roll the dough into a rectangular on your work surface. 40×70 cm is a good size. 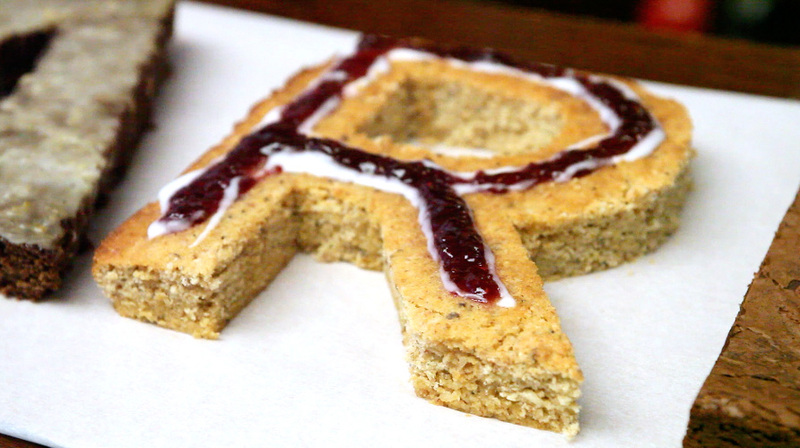 Place the korvapuusti’s on a paper baking tray with the pointy side up and press them down with your finger. Korva is ear in Finnish, this is where they get their name from. Past weekend we had a naming party for our now 15-week-old boy, Oskari. For the party we decided to make 6 cakes spelling his name. See below for the result. Some of the recipes are already here on Crofton Tales, rest will follow in the next few weeks so stay tuned. There’s two reasons for going with Gotham as the font. 1) it has a perfectly round capital O and 2) it has plenty of straight edges that are easy to cut. Other matters influencing the choice were that this font saw a lot of use in Obamas campaign posters. Name of the font, Gotham, also reminds us of Batman, the one and only true super hero. Not a bad crowd to be associated with. Making the letters turned out to be pretty easy. I bought two new silicon bases from Sainsbury’s, one square (21 by 21 cm) and one round (21 cm in diameter). I used the O as size guide and printed templates of the letters on A4 sheets. Then it was just a matter of cutting them out once the cakes had cooled down. It’s worth a mention that most of the off cuts never made it to the party.